As a company Heckyl is known for its big data capabilities finding, collecting, analysing and visualising millions of data sources from around the world, to provide actionable financial insight. This data can then be provided to end users, such as retail traders to help them make informed investment decisions. However valuable big data also resides within financial institutions and if analysed and visualised in the right way, can be even more powerful. This is the other side of Heckyl’s approach; working with clients to harness the data they have internally, sometimes mixing it with the external data we also collect. The continued commoditisation of market data means that retail traders can find share price and fundamental data from a wide variety of sources. The challenge facing retail brokers in the UK market is differentiating their platform and keeping clients engaged. Utilising some of Heckyl’s external data sets such as sentiment and twitter alerts is a good approach. However there is a vast source of internal data that Heckyl can help Brokers analyse and visualise, to help their end clients become better traders. By analysing the clients trading details Heckyl is able to build up a profile of the user and help them understand their strengths and weaknesses, with the aim of making them a more profitable trader. Heckyl’s has recently deployed this new Portfolio Analytics platform for a number of clients in India and we believe it represents the next generation for trading platforms. Deployed as a ‘black box’ within the Broker’s infrastructure, the system analyses a number of key parameters to provide a 360-degree view. The system provides a number of views, providing key details and analysis for the user. 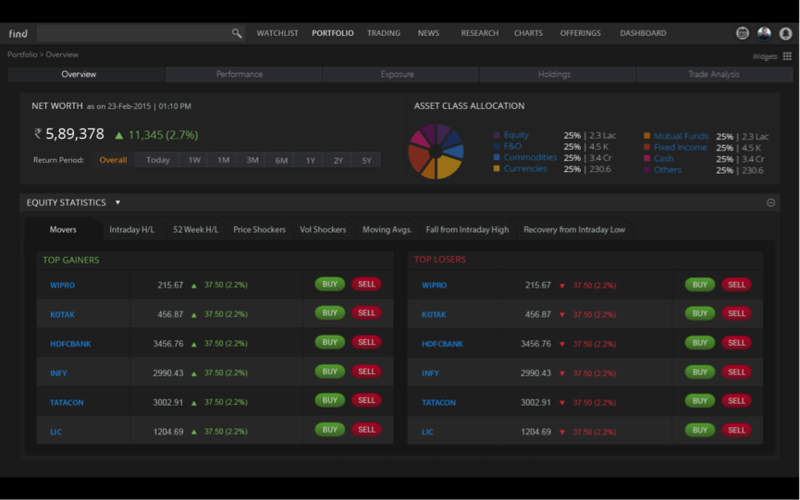 The summary screen offers a high level view of the users’ portfolio, including asset allocation and top gainers and losers. The charting allows a user to review their trading performance over various timeframes, as well as filtering based on realised and unrealised gains. An overview is also provided of the users’ performance over the last year along with their risk characteristics. The portfolio holdings screen allows users to see their entire holdings, with key metrics, as well as grouping holdings based on sectors or market cap, as well as filtering and analysing their holdings based on personal parameters. The trade analytics view allows a user to review their trading behaviour, such as the most and least profitable trades, which sector and market size investments have been most effective. It also displays the best additions, best exclusions, worst additions and the worst exclusions to the portfolio. This helps the user to find out their strengths, missed opportunities and fine-tune entry and exit points for trades, to help them find their best trading strategies. 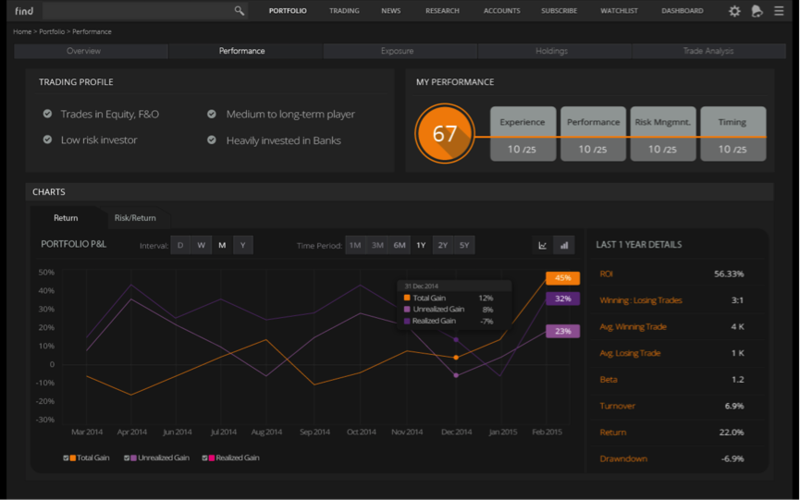 In addition to this client view, Heckyl also provides its Brokers with a real-time dashboard of client behaviour and trading statistics. The vast sources of data available from the Internet are hugely valuable, but the analysis and visualisation of your internal data is even more powerful for your users, when done effectively. Here at Heckyl we believe that this is the future for online research and trading platforms for retail Brokers. Presenting flat data is no longer sufficient to help users navigate the world of trading, we are moving into a time of smart analysis and actionable data. The interpretation and presentation of the underlying data is crucial for both Brokers and their clients. By educating the end user in how to be a better trader you can help them become better investors, at the same time helping your own business develop and grow. It’s my fourth visit to your blog and every time I got something new things to read and learn. Thank you so much for this great work. What is the price for Heckyl platform ? Is it at all available for retail trader ? Or is it only available as part of brokerage account ? Heckyl’s Platform is not available to individual traders. It is available only as a part of brokerage account. Depending upon the requirement and agreement with different broker firms , one may get all or some or only the key features from across the different brokers. For accessing the Platform, a retail investor or the trader will need to get in touch with the respective Broking Houses to get guidance on the accessibility and /or availability of the kinds, numbers of features or any other such related questions like demo etc . We are happy to share with you the list of the Broking Houses in alphabetical order: Angel Broking, Bonanza Online, Edelweiss, Geojit BNP Paribas, Globe Capital, India Infoline, ICICI Securities, JM Financial, Kotak Securities , Reliance Capital, Religare , SMC. Please let us know wherever you might need help further. We are glad for your keen interest in Heckyl and look forward to your feedback. Do visit our website http://www.heckyl.com to know more. You may also subscribe to our blog, Heckyl’s Alpha Pulse(blog.heckyl.com) and stay connected with us on Facebook, Linkedin and Twitter.